Background: Glucocorticoids are powerful and effective anti-inflammatory and immunosuppressive drugs. They have extensive use in the treatment of different diseases, even though their side effects, such as hypertension, osteoporosis and, in particular, diabetes, are well known. They can exacerbate hyperglycemia in patients with diabetes mellitus or facilitate the development of metabolic disease in apparently healthy subjects, the so-called steroid-induced diabetes mellitus. The last one is an independent risk factor for other complications associated with the use of glucocorticosteroids. Objectives: We tried to clarify the physiopathology and the correct management of glucocorticoidsinduced diabetes, referring in particular to diabetic patients who have to take such drugs for long periods. Methods: A thorough literature search was performed using Pubmed database to cover all relative reports, using combinations of keywords: diabetes mellitus, insulin, glucocorticoids therapy, dipeptidyl peptidase- 4 inhibitors (DPP-4 inhibitor), glucagon-like peptide-1 receptor agonists (GLP-1 receptor agonists), sodium-glucose co-transporter-2 inhibitors (SGLT-2 inhibitor), hyperglycemia, glucose-lowering drugs. 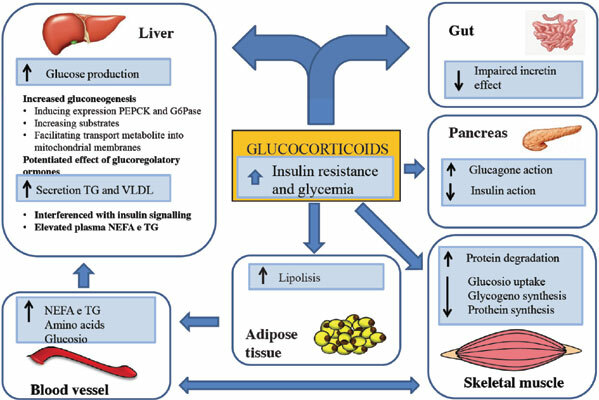 Results & Conclusion: Glucocorticoids-induced diabetes is a harmful and underestimated problem when the therapeutic program is not correct and well planned. Screening or more stringent monitoring must always be suggested before starting with corticosteroids; moreover, the hypoglycemic therapy should be personalized, based on the severity of hyperglycemia, type of steroid used and patients’ comorbidities. All the oral glucose-lowering drugs can be used, but insulin is the most studied drug and the medication recommended for severe hyperglycemia, for patients with pre-existing diabetes or for those patients who have to undergo prolonged therapy over time. Hyperglycemia, glucocorticoids, anti-inflammatory, osteoporosis, diabetes mellitus, antiproliferative drugs.